A new series from Janet Evanovich! 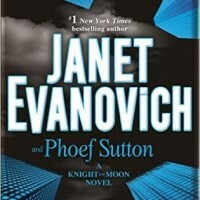 So pleased to announce that I'll be narrating a new series from Janet Evanovich (co-written with Phoef Sutton)! The first book is 'Curious Minds', and it features two great new protagonists - Knight and Moon. Can't wait! "Emerson Knight is introverted, eccentric, and has little to no sense of social etiquette. Good thing he’s also brilliant, rich, and (some people might say) handsome, or he’d probably be homeless. Riley Moon has just graduated from Harvard Business and Harvard Law. Her aggressive Texas spitfire attitude has helped her land her dream job as a junior analyst with mega-bank Blane-Grunwald. At least Riley Moon thought it was her dream job, until she is given her first assignment: babysitting Emerson Knight. What starts off as an inquiry about missing bank funds in the Knight account leads to inquiries about a missing man, missing gold, and a life-and-death race across the country. Through the streets of Washington, D.C., and down into the underground vault of the Federal Reserve in New York City, an evil plan is exposed. A plan so sinister that only a megalomaniac could think it up, and only the unlikely duo of the irrepressibly charming Emerson Knight and the tenacious Riley Moon can stop it."